We undertook this audit at the request of the chief operating officer following allegations of improper and irregular handling of gift cards. The chief operating officer suspended purchase of gift cards in early October 2012 and directed departments to turn unused cards in to the Department of Human Resources. Four departments turned in 737 cards valued at $33,875. 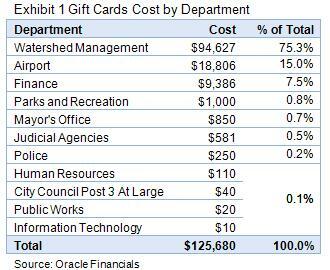 Department records of card distribution and use, especially before fiscal year 2012, are inadequate to account for the disposition of individual gift cards. Federal and state guidelines identify gift cards as cash equivalents that should be computed as part of an employee’s taxable compensation when provided as employee recognition.